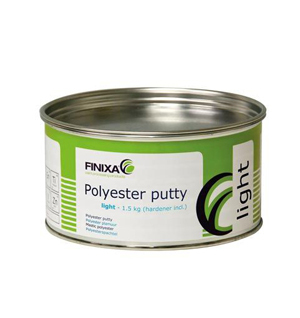 LIGHT – universal finishing putty. A real light weight, same applications as “MULTI” putty but results in the same fine finish as “FINE” putty, easy sanding. User info: mix your putty always with 2 to 3 % hardener; if you have any doubt, please use a balance. Too much hardener causes not only a fast drying, but can also cause detachment of the putty and can leave marks through the paint. Mix the hardener very carefully with the putty and avoid air infiltration during mixing, this can give irregularities during application and sanding of the putty. Choose the right putty for the right application. MULTI – universal 2 K polyester putty. Can be used on most bases such as steel, wood, plastic …. Less suitable for light metals and galvanized bases. Can be finished afterwards with FINE putty or directly with an undercoat, primer or filler. FINE – fine finishing putty. To be used after “MULTI” putty to remove small irregularities. A real finishing putty, easy and fine sanding. FIBER – a full fiber putty. A universal polyester putty with glass fibers to fill up larger surfaces and bigger irregularities; also perfect for polyester applications and reparations. ALU – a polyester putty refined with aluminium particles. Can be used on light metals and galvanized surfaces. A quality filler for general use and adhesion to all types of metal (also aluminium) and plastic. > Universal filler, adheres to old painted surfaces, but also to steel, galvanised metal, aluminium, all kinds of plastic, wood and MDF. > Already during application, the black shining filler offers visual aid, as on a black shining surface it is easy to see all irregularities / imperfections with the naked eye. > Built-in sanding guide: during sanding the putty fades from black to dark grey. The spots that are too low (not sanded) clearly remain black. > Once degreased, the filler regains its deep black colour. Inspecting for possible irregularities is easy now. > Built-in coating guide and sanding through guide: whether one finishes with beige or grey filler, once the black colour is covered, one can also be sure of the necessary thickness of the filler coating. If afterwards one would sand through the putty accidently, the black base will occur as a sanding through guide.